OptionsXL Pro is a solution for downloading options data into Microsoft Excel spreadsheets. 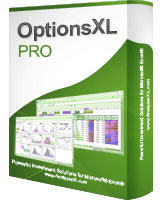 OptionsXL Pro is a ready-to-use solution for options data download and analysis in Microsoft Excel spreadsheets. OptionsXL Pro is a ready-to-use solution for downloading options data into Microsoft Excel spreadsheets. It is designed to help traders perform precise market analysis and make reasonable decisions. OptionsXL Pro is provided as a ready Excel workbook set up for a specific ticker the user needs. OptionsXL Pro works seamlessly in Microsoft Excel environment. OptionsXL Pro supports one workbook per one option chain. TraderXL and AnalyzerXL packages buyers are eligible to obtain 5 and 3 OptionsXL Pro workbooks, respectively. What if analysis function allows changing stock price and volatility values and watching how it is reflected in the charts. DoneEx XCell Compiler - A easy and quick tool to create, manage, analyze and share more secure data and create PDF documents.